iCrumz is a very simple yet extremely useful bookmarking service. 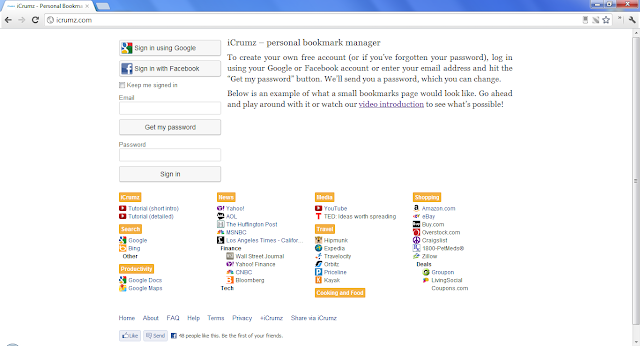 You can quickly add a website to your personal bookmark page via the bookmarklet. From there you launch saved websites, edit them, and organize via dragging and dropping. Nothing is stored locally so this is a perfect option to pull up your bookmarks on your mobile device. Follow them on Facebook and Twitter. Nothing is stored locally so bookmark manager this is a perfect option to pull up your bookmarks on your mobile device.